El Paso's Lower Valley is a mix of urban and rural, industrial and pastoral, with one international crossing, a mix of historic missions and tourist attractions and several large parks and wildlife sanctuaries. The lower valley forms a large part of El Paso's agricultural heritage, and still contains cotton farms and pecan groves. A large part of the valley is within the city limits, and as it extends east past those boundaries it maintains an rustic, rural feel. Numerous mom and pop restaurants line Alameda, the major east-west artery; the street is mostly retail-oriented, with some residential. Most people live in the streets off Alameda, which extend into quiet, tree-filled neighborhoods. Alameda runs east to the Ysleta Pueblo, the Tigua Indian reservation that forms a large part of the Lower Valley's culture. The Tiguas own and operate the Tigua Indian Cultural Center. The cultural center includes Speaking Rock Casino,with slot machines, Bingo, entertainment, as well as fine dining at Wyngs Restaurant, and the Spirit Garden. The Mission Trail, which includes the towns of Socorro and San Elizario, forms another major attraction. Some of the missions date back 400 years, to the beginnings of European exploration of North America. 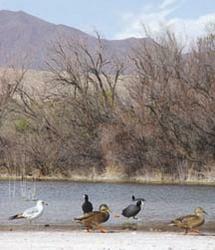 The Lower Valley also has two wildlife preserves, Rio Bosque and Feather Lake. El Paso's Upper Valley is a retreat from the baking sun and desert sands that cover the rest of the city. This shady, and comparatively lush, riverside oasis is notable for its larger estates and country lifestyle. Its distance from the rest of El Paso - 20 minutes from Downtown and 30 minutes from the airport - may contribute to its laid-back country manner. Doniphan, which is the main strip bordering the east side of the Upper Valley, has plenty of amenities including grocery stores, bar-b-que joints and outdoor patio bars. The El Paso Country Club and Santa Teresa Golf Club, along with the Sunland Park Race Track & Casino, are just some of the more popular recreational opportunities available. The neighborhood is served by Santa Teresa, Coronado, Franklin and Canutillo high schools. Although lacking in total park acreage, the Upper Valley has some beautiful riverfront bike and running paths that attract enthusiasts from around the city. Keystone Heritage Park, a 4,500-year old archaeological treasure situated on a river-fed bosque, provides breathtaking nature theater, starring the millions of migrating birds who make this a stopping point during their travels up the Rio Grande valley. Outside the city limits of El Paso and within the County of El Paso are the towns of Tornillo, Socorro, San Elizario, Clint and Fabens. These are mostly farming communities with a rich history dating back hundreds of years. Twenty years before the Pilgrims ate their famous meal in Plymouth, Spanish explorer Don Juan de Onate and his troupe crossed through San Elizario and celebrated the First Thanksgiving in the United States. The Mission Trail runs through three of the oldest continually active missions in the United States. 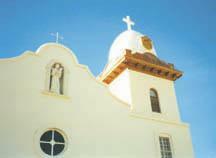 The Ysleta Mission, Presidio Chapel San Elizario and the Socorro Mission are great visits for locals and tourists alike. Area residents enjoy the historical perspective, but cite tranquility as the main reason for choosing East El Paso County. Hueco Tanks State Historical Park speaks to that lifestyle. The park is named for the large natural rock basins that make for world-class rock climbing, as well as hiking, picnicking and camping. Each town in East El Paso County has its own school district with a high school, and each district boasts a diverse student body. Socorro Independent School District has been nationally recognized for its bilingual and special education programs. East El Paso County is remote enough to have a down-home feel to it, but it is within driving distance of the resources available in the bigger city of El Paso. Downtown El Paso is a 35 to 40 minute drive from this area; the airport is 25 to 30 minutes away. Located three miles east of the El Paso city limits on Interstate 10, Horizon City is a residential community of about 5,800 and about five square miles in area. Horizon City was a popular retirement area in the 1970's but recently younger families have been moving to the community in increasing numbers. The town was incorporated in 1988 and has established its own town council and several public facilities. 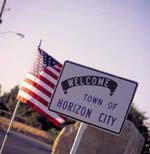 Horizon City is a young town just beginning to attract retail businesses. The town features two new shopping centers and a supermarket, as well as the popular Emerald Springs Golf & Conference Center. A senior center, two elementary schools, and a middle school also serve the area. The West Texas Airport is just North of the city, catering to small charter planes. Powered by HomesofElPaso.com Copyright 2008 - 2019 Debbie Reavis.